All three titles in the ‘Foundry’ SDX suite. 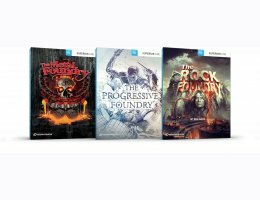 This bundle includes three individual SDXs, all from the hugely popular ‘Foundry’ series; The Metal Foundry, The Progressive Foundry and The Rock Foundry. In total, you get 19 kits and in excess of 163 GB of raw, unprocessed drum sounds recorded in three world-class studios in different parts of the world. With three fundamentally different drum rooms and a wide range of instrument choices, this collection is the ultimate starting point for transparent, broad-scope drum production in Superior Drummer 3. The first and now classic title in the ‘Foundry’ suite was recorded and produced at the Atlantis Studios in Stockholm, Sweden, by Meshuggah drummer Tomas Haake together with engineers Mattias Eklund (Toontrack), Fredrik Thordendal (Meshuggah) and Daniel Bergstrand (Dugout Studio). With all thinkable dimensions, depths, widths, brands and materials of instruments, this collection provides a uniquely broad palette of sound. This SDX was recorded at the renowned Sing Sing Recording Studios in Melbourne, Australia, by engineer/producer Forrester Savell and drummer Steve Judd (Karnivool). With drums scoured from all four corners of Australia, all captured with top tier microphones and rare outboard, this SDX gives you the best of vintage and modern recorded in a perfectly crafted room. This SDX was recorded by engineer/producer Bob Rock at The Warehouse in Vancouver, BC. In addition to the seven individual kits, a large selection of extra snares, kicks and cymbals are provided, making The Rock Foundry SDX an incredibly versatile source of raw sound material – all captured in the large, reverberant hall of The Warehouse. Windows 7 (64-bit ) or newer, 4 GB RAM (8 GB RAM or more recommended). Mac OS X 10.6 or higher, 64-bit Intel-based Mac with 4 GB RAM (8 GB RAM or more recommended). 64-bit host (with support for VST, AU or AAX).